The 2016 Chevrolet Spark is a completely redesigned and more sophisticated execution of the brand’s successful global mini-car that offers greater efficiency and refinement, along with new, available safety and connectivity features. by Jim Corbran, Automotive Columnist Chevy’s smallest car is about to grow a bit. Just a bit. The upcoming 2016 Spark will be built on an entirely new architecture which will have a slightly longer wheelbase, and a 1.6 inch reduction in height to reduce drag. Changes to the interior design will help the Spark retain its generous headroom. The front end styling is cleaned up a bit from the current model, which greatly resembles the slightly larger Sonic, and that’s a good thing. The lowered height helps it somewhat lose the typical minicar look of “too narrow for its height,” which often makes it look toy-like at best, or like something that should tip over on turns at worst. Under the hood is an all-new Ecotec 1.4L I-4 engine, and it’s connected to either a manual or CVT transmission, which together should deliver around 40 mpg. A host of safety features will be available, including side blind spot alert, lane departure warning, and forward collision alert. The fun attitude of a tiny car shows up in the Spark’s color palette, with includes choices such as: Toasted Marshmallow (kind of an off-white), Kalamata (a purplish blue), and Salsa (a hot red, of course!). Models series will be the base L, and the1LT and 2LT. Seating in the Spark is black… very black, either in cloth (L and 1LT) or leatherette (2LT). While the L’s interior will be totally black, the 1LT and 2LT will have choices for contrasting trim pieces on the dash and door panels. As GM tells us, the 2016 Spark will be built, from globally-sourced parts, at their Changwon, South Korea assembly plant, and will be in U.S. showrooms in the fourth quarter of this year. 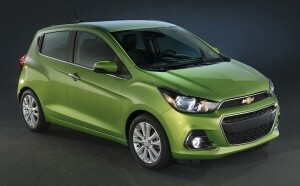 more info at: http://chevrolet.com/2016-spark.html ### The post THE 2016 CHEVY SPARK: BIG CHANGES COME IN SMALL PACKAGES appeared first on Buffalo Cars.